This is the story of Mr Kihachiro Onitsuka. A story that started from a humble idea that sport had the power to transform lives. Anima Sana In Corpore Sano - sound mind, sound body. The Latin maxim that was the ethos behind Onitsuka Tiger, and later became the acronym ASICS. In the beginning, we set out to help the youth of Japan and rebuild a better future after the War ended in 1949. We believed playing sport was the best way to unite people and connect communities. Sixty years on, this same philosophy remains. Our focus on carefully crafted details and an ongoing urge to innovate is what has allowed us to take Onitsuka Tiger to the world. This is a story of an octopus. An eight-legged delicacy fated to be so much more than somebody's supper. Whose tentacle got stuck to a salad bowl served to Kihachiro Onitsuka. And became the inspiration for Onitsuka Tiger's breakthrough sports shoe innovation: the suction cup sole on the 1950 OK BASKETBALL SHOE. Its grip allowed players to make the fast breaks and sudden stops essential to the game. Little wonder the Japanese high school team that first wore the shoes won their championship. A light-bulb moment came when a steaming hot bath wrinkled the toes of Kihachiro Onitsuka. That made him realise heat was the cause of blisters on runners' feet and inspired him to study the air-circulating systems for his long-distance shoes. The innovative holes were first seen in the 1959 MAGIC RUNNER that was lighter, faster and allowed feet to breathe. Japanese innovation came into its own at the 1964 Tokyo Games. It was here that the iconic RUNSPARK made its debut - Onitsuka Tiger's first fixed-type track spikes for athletes. With four different spike lengths available, an athlete could change them to meet any track condition. Many variations of shoe structure were tried in this series, such as soft sponge being layered into the heel to help absorb shock to the foot when it hit the ground. Our real mark of progress was made in 1966 with the legendary lines that remain, unchanged, on every pair of Onitsuka Tigers and ASICS today. First seen on LIMBER UP KAWA BK, designed for the pre-trials of the Mexico 68 Games. 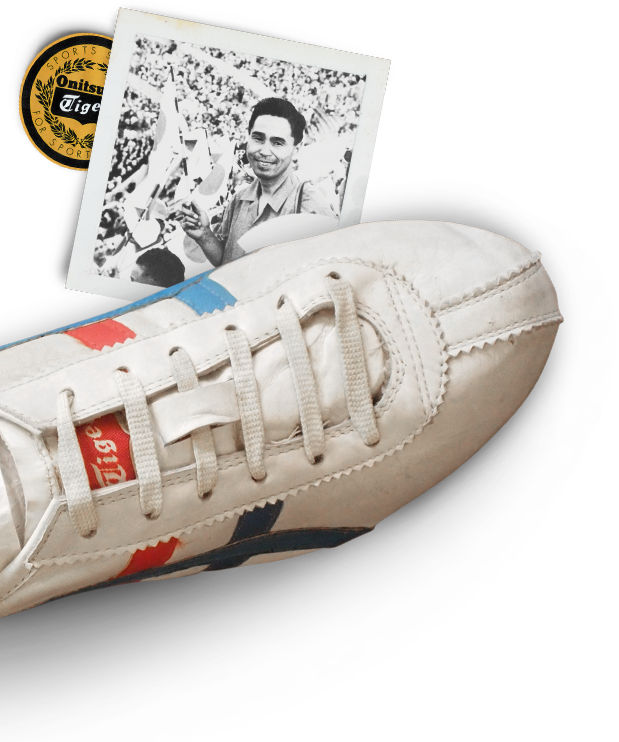 Today, reincarnated as the MEXICO 66 - the most popular shoe in our collection. Regular performance at the Olympic Games helped Onitsuka Tiger earn its stripes as one of the most successful sports shoe companies in Japan. And the rest of the world did more than sit up and notice. Phil Knight, an American middle distance runner and protegee of Bill Bowerman spoke to Mr Onitsuka as part of his MBA in marketing athletic shoes and loved the new TIGER CORTEZ that had just been released. Blue Ribbon Sports, the company he set up to bring Onitsuka Tigers to the USA, would later become Nike. The CALIFORNIA was made for jogging. It helped maintain the arch of the foot and give firm support to the toes, while the form-fitting insole allowed enough room for the toes to move. The wide, rounded heel aided in balance while landing, and the wide, curved-up toe assisted in forward movement. As a safety feature, the CALIFORNIA also had reflective patches stitched on the back of the shoes, so that drivers could see the runner from 300 meters away at night or on rainy days. As Onitsuka Tiger grew to become ASICS, and go on to establish itself as one of the world's leading sports brands - we always knew the spirit of our heritage would live on. A history that prided itself on a Japanese craftsmanship combined with a timeless aesthetic that was discovered on the track, and later worn on the street. This rich heritage inspired us to relaunch Onitsuka Tiger back into the world in 2002. Classics were refreshed, reinterpreted, reinvented. Taking the original Onitsuka Tiger sports shoes as a starting point, we made changes to cuts, colours and construction to bring you made-for-living remodels of the MEXICO 66, CALIFORNIA 78 and NIPPON MADE. A rebirth, a revival, but not a repeat. Classics refreshed, reinterpreted, reinvented. We are constantly branching out and collaborating with a variety of creative souls, from visual artists to fashion designers, from art collectives to sneaker boutiques. The collaboration projects over the years bring fresh air into our collections and create excitement for our fans. The Tiger revival was energised by the master of cross-reference and reinvention of past aesthetics himself. The super streamlined, yell-out-loud yellow TAI CHI gained cult status after starring in the 2003 film Kill Bill. In 2010, we released a limited edition of 250 pairs of TAI CHI. Every pair was hand delivered in a special Chinese take-away packaging to some very lucky sneaker heads. California is the spiritual home of the jogging and fitness crazes of the 1970s and 1980s. CALIFORNIA 78 was an icon of that era's Onitsuka Tiger. In 2013, we celebrated the 35th anniversary of its impact on sport and fashion with a limited edition of 1978 pairs. To celebrating Onitsuka Tiger's Japanese roots, between 2007 and 2009, each year we created a meter-long shoe with different themes: "Japanese memorabilia", "Tansu cabinet", "Zodiac Race" and "Electric Light". We delivered literally on our promise that Onitsuka Tiger is 'Made of Japan'." Born from the love of sport, our passion for it moves us forward. For us, movement is about subtlety, nuance and beauty. It's capturing every detail in the dynamism of modern life. We call it the Craft of Movement, and we set out to capture it in modern day Japan for the SS13 brand campaign. In just five days we rebuilt the bustling streets of Tokyo across three scenes. We created the Nippon Made collection as wearable masterpieces for your feet. It's unique for its high-quality materials, meticulous attention to detail and remarkable Japanese craftsmanship. Every pair is handmade by Japanese craftsmen using labor-intensive leather tanning and wash-up methods. No two pairs is alike. Introduced in 1966, this is the iconic Mexico 66 shoe born with unmatched heritage. A fine example of Onitsuka Tiger 80's style running shoes. Based ofF a training/running shoe in the 1980's, called the 'Montreal'. Introduced in 1966, this is the iconic Mexico 66 shoe with casual flare.